Caley Jackson brings his love for the outdoors to his job as a Senior Technician at Geo-Dredging and Dewatering Solutions, a key business partner for Bishop Water Technologies that provides turnkey sludge cleanout services. Since joining the team in December 2013, Caley has been responsible for managing dewatering projects at sites across Ontario. He works directly with clients and staff at Bishop Water to plan all of the details for each project such as the laydown area for Bishop Water’s solids management solution, how the dredge will access the lagoon and remove the sludge, selection of chemistry, and more. Caley says his most interesting project so far is definitely a mine cleanup project in Peterborough, Ontario. The mine has been around for almost a century and the site was contaminated with high levels of arsenic, cobalt, copper, nickel and zinc, along with low levels of radioactivity from uranium. Caley also works hand-in-hand with clients to plan and execute BioCord projects that ensure wastewater treatment lagoons consistently achieve regulated ammonia levels year-round without expanding a plant’s footprint and adding tanks, filtration or other complex equipment. Prior to joining Geo-Dredging and Dewatering Solutions, Caley worked as a River Guide and Manager in Banff National Park for 12 years. 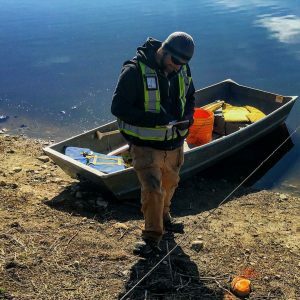 Caley says that he enjoyed spending time outdoors and wanted to go back to school for a program that would enable him to pursue a career outdoors so he joined the Environmental Technician program at Algonquin College. The program enabled Caley to obtain theoretical and practical training related to four disciplines in the environmental sciences including biology, chemistry, physical science and engineering. Caley started working on projects with Bishop Water Technologies while completing his diploma and the rest is history. Learn more about Geo-Dredging and Dewatering Solutions.